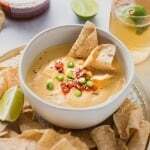 This creamy cashew queso dip is made with ZERO processed ingredients for an authentic tasting, full flavored, dairy free alternative to this well loved dip. SO crave worthy and made with anti-inflammatory, good-for-you ingredients! Vegan + whole30 compliant. Soak raw cashews for at least an hour, or up to overnight. Drain and rinse cashews and add to blender along with just boiled water, mustard, lime juice, chili powder, nutritional yeast, turmeric powder, hot sauce, and sea salt. Blend on high for a minute or two, until very smooth and creamy. If the mixture is too thick to blend, add more boiling water a little at a time until it blends smoothly, but is still quite thick. Once fully blended, transfer to a bowl and stir in salsa. Taste and add more salt or hot sauce if desired. Top with thinly sliced green onions and a little extra salsa and serve warm with chips or veggies for dipping! Will keep in a covered container in the refrigerator for up to 5 days.